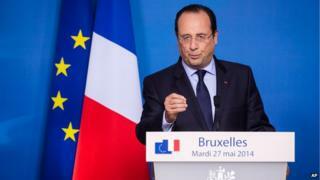 Image caption After a shock result President Hollande is not arguing now for "more Europe"
Europe's leaders gathered in Brussels knowing that there had been a huge protest vote against the European establishment. The number of MEPs from Eurosceptic parties had doubled. The election result has sapped confidence. That was apparent when they met for Tuesday's informal dinner. Most of the leaders gave rather cautious and coded comments. They were men and women who had lost some of their certainty. David Cameron arrived early with a prepared soundbite that Brussels had become "too big, too bossy and too interfering". He had his allies: the Dutch Prime Minister, Mark Rutte, said he thought the answer lay in "fewer rules and less fuss from Europe and for Europe to focus on where it can add value". More surprisingly, there was a similar tone from the French President Francois Hollande, who said the EU should "concentrate more on its priorities, show more efficiency where it is needed and not to add things where it is unnecessary". Such expressions are the easy part. Other leaders are wary of calls for "less Europe". In any event it will be very difficult to rein in Brussels. France is firmly against treaty change. The Elysee Palace believes it is a matter of "reorganising working methods and approach". If David Cameron is to sell to the British public a new relationship with a reformed union he will need much more concrete change than that. But the dominant mood was that the answers lay in rediscovering growth in the economy. Several leaders clearly believed that the Eurosceptic surge would fade as the economy improved and unemployment declined. That is the view of the Italian Prime Minister, Matteo Renzi, President Hollande and German Chancellor Angela Merkel. They are divided, however, over how to revive the eurozone economy, with its tepid growth. "How we generate growth," said Angela Merkel, "there are differences of opinion". Many leaders would like to see targets for reducing their deficits relaxed, and are looking to next month's European Central Bank meeting to cut interest rates and boost funds for the banks. But the Germans still believe that budgetary discipline and structural reforms (labour market flexibility) are the road to economic growth and stability. These underlying tensions were also apparent over the issue of who should get Europe's top job, President of the European Commission. It was curious to see the attention given to this at the late-night news conferences, when top jobs probably had little or no impact on the way people voted. The frontrunner to become Commission president is the former Prime Minister of Luxembourg, Jean-Claude Juncker. Why? Because he was the candidate of the grouping which gained the most seats in the European Parliament. Many of Europe's leaders, however, believe it is their right to nominate a candidate, taking into account the results of the elections. In part this is a turf war between a newly assertive parliament and the heads of government. David Cameron has led the charge against Jean-Claude Juncker. He believes that he is a classic Brussels insider, committed to further integration. He is not the kind of figure that the prime minister wants to see as chief executive in Brussels, at a time he could be trying to renegotiate the UK's relationship with the EU. David Cameron has some allies including the Swedish, Dutch and Hungarians. Crucially Mr Juncker is the candidate of the EPP, Angela Merkel's grouping. At the end of the dinner she appeared to weaken her support for her candidate. She recognised he might not end up with the top job and she appeared disinclined to oppose David Cameron. It was important, she said, "to preserve the good working atmosphere of the European Council of EU leaders in times of crisis". Weeks of meetings, deal-makings and arguments lie ahead. The danger for the EU is that an institutional fight over top jobs becomes yet another example of the inward-looking culture of Brussels. The word "change" was very much on people's lips. But how to deliver a more efficient, less intrusive Commission and how to deliver a more dynamic job-creating economy will be a long and difficult process. Meanwhile the Eurosceptics and anti-establishment parties have a platform from inside the parliament to shake the institution from within.